Need rubbery playdough? We have the perfect recipe for you! The texture and feel of this playdough is really cool. Not bad considering how few ingredients it takes to make it. Ive researched this playdough recipe quite a bit and the missing ingredient that I’ve found is the oil, it really makes the difference. Once doughy, remove from heat. Enjoy your finished playdough, just allow to cool first. We know you will like this playdough recipe, it’s easy to make and the finished result is really cool. It’s a bit diffeent from the traditional playdough so your kids will notice the difference. If you find the description above unclear, fear not, we give you the extended description with step-by-step images below. Gather up the ingredients needed and we can get going. 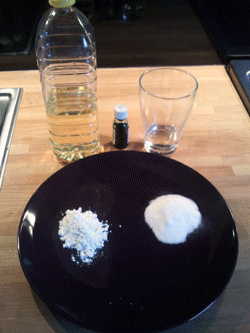 We have baking soda, cornstarch, water, oil and food coloring. You can ditch the food coloring if you don’t feel like using it, but the playdough will look more exciting with it. 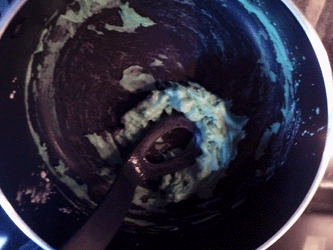 We mix the ingredients in a pan, without the food coloring it will look like this. 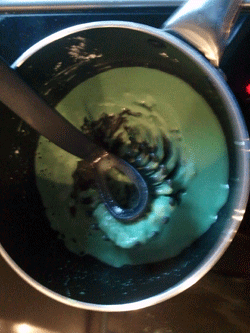 Quite a boring color, but we got the remedy for that, some green food coloring. The more you use, the greener will the playdough be. When you’ve heated the mixture for a minute or two, it will look something like this. From this point it will quickly change to finished playdough. Don’t burn it. When everything sticks to the tool you’re using, the playdough is done. It will look like this. 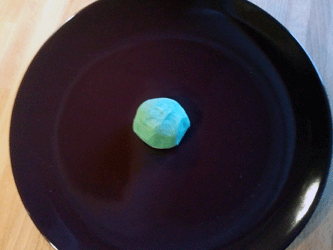 Remove the finished playdough from the pan, but remember that it’s hot, so you should let it cool a bit first. My finished playdough looked like this, and it’s really rubbery, just like we wanted. Another great thing with the added oil is that it will work against the other ingredients, since they have a tendency to dry out your hands. Enjoy! Can you add the oil after? Like the last ingredient you mean? Probably, give it a try! Will the oil in it leave oil stains on clothes etc.? I can’t guarantee that it wont. 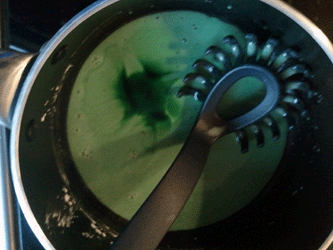 The food coloring might also stain if you choose to use it. This was so easy and so far has turned out pretty good. This stuff is amazing!!! I just made it and so far it’s indistinguishable from the real thing! when using food colouring do you find that the colour runs onto your hands after its done or is it colour safe? 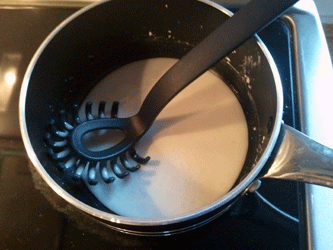 You will get some of it on your hands, but you can lessen the effect by using some handlotion before you begin mixing. This was cool my 11yr old,9yr old and 6yr old love this and are having a ball!! !Not so bouncy at least yet!But they are having a blast! Ok to store in fridge? Or is airtight container at room temp better? To answer some questions…the food coloring doesn’t stain..at least its hasn’t yet and we’ve made this 3 times. The oil doesn’t stain either.Play dough,so far,has lasted 2 weeks in air tight container. 1cup of baking soda??? Sounds too much! Playdough came out perfect! Had a Baby/Toddler craft party and the recipe I used for the Playdough was the worst. I made Playdough from this recipe and it came out perfect! This is a great quick way to make Playdough… I redeemed myself and have now made batches of Playdough to give out to the Moms! How long do you wait to play with it Will the food color rub off in hands? The food colouring has been fine but the oil (or anything oily) will stain clothes if you press it into the fabric. The playdough is super and ours has lasted one week in an air-tight container, after which it turns sticky and unpleasant. I added mixed spice to make ‘gingerbread men’, which smelt delicious and was a big hit with my son.